The day that I met Amanda we were in grade 9 gym class at Eastview Secondary School. I remember being SO scared starting highschool and starting with gym I was really insecure. Seeing this beautiful, athletic, and outgoing blonde girl I was comforted. There was something about her that drew me in. When Amanda and I met, I felt like God whispered to me, “Erin, you need to be friends with that girl.” I always tried to be her partner (even though she would pretend to tie her laces to be partners with the person picked last), and talk to her in the change room. I had a feeling she was a christian by her WWJD (What Would Jesus Do?) bracelet that she wore on her wrist (it was a popular thing to do back in 2009 haha), and by the shirts she would wear for gym. Once I asked her about her bracelet, and when she explained it to me I couldn’t stop thinking about it. The back of her t-shirts for gym class had that familiar gecko with the phrase “I’m Stuck On Day Camp” – a legendary t-shirt for the summer day camps at Willow Creek Baptist Church where I went every summer as a kid and experienced God in a powerful way. I soon figured out that Amanda excelled at almost everything, from sports to academics, to being a popular student in the class. But there was something much larger that drew me to her – it was Jesus. Amanda’s love for Jesus inspired and challenged me. She had something incredible which carried her through every situation. It was something that I craved and wanted to have too. I wanted to know Jesus the way Amanda did. In grade 9 along with a couple other Christian girls we started a girls group Mondays after school with some of the Christian female teachers. We would pray and learn about God. With the girls busy schedules often I would be the only one who could attend and I cherished the opportunities to learn more about Jesus and to receive wise advice about various situations in my life. My friendship with Amanda grew as she continued to teach me more about Jesus and the Bible. The summer after grade 9 we attended the youth camp at Willow together, and it was there singing Mighty to Save, holding hands with Amanda, that I decided to fully surrender my life to God. In grade 11 Amanda spearheaded a christian club at the school that is still present today. We would meet at lunch to pray and learn from the Bible. I also started attending a girls group during weekday nights with other girls from Willow. No matter where God was working in my life during high school, or what I was learning, Amanda was always there being used by God in incredible ways. I don’t think she ever realized the impact that she had on my life and my spiritual journey. Amanda and I were in several classes and lunch periods together and over the years our friendship deepened. The other day I was looking through some old things from high school and I found our old notes we would write to each other. This was before camera phones, endless photos and facebook, and yet I deeply treasure these notes. They are filled with encouragement, promises of God, and scripture. Amanda was always there to pray with me, laugh with me, and help me with homework (notably science), on more than one occasion! She was always giving to others, thoughtful, and inclusive. We would go on dates together to the movies, to get a manicure (for her 17th birthday), and she even took me to the Christian bookstore for the first time (I was amazed haha). It was a friendship that I deeply honored and respected. I always looked up to her and admired her – she was one of my best friends. I loved how intuitive she was: once when I was really stressed about school she wrote a poem for me called A Nice Distress Poem. Staring straight through the bluebird skies, I rest my head and my mind flies. The sun turns her gaze upon my face, Dazzling me with her majestic grace. Soaring higher, higher, always up, I breathe fresh air as He fills my cup. Bright lakes bejewel the grassy hills, A breathy wind sways the tress, my soul it fills. Spinning, laughing, I dance across these open meadows, Gliding o’re the fields spread wide, I hear those bell-like echoes. Great birds cast shadows in my watching eyes, Their flighty course, does fall, does rise. Running faster, faster, and faster still, I take flight and fly with will. I always assumed she wrote that – isn’t it gorgeous? One thing I LOVED about Amanda was her firm identity in Christ. She knew she was God’s (or Pappa as she called him), little Princess. She loved pretty things, beautiful dresses and sparkly earrings. She would tell me how beautiful and precious I was to Jesus, and how all girls were princesses. Among my friends, these are character traits that I am known for – so know they came from her. We both loved Anne of Green Gables, the movie A Little Princess, C.S. Lewis, and The Lord of The Rings. She was a Kindred Spirit (inspired by Anne herself). Amanda also threw the BEST birthday and Christmas parties – they were legendary. Amanda and I were both dreamers and we would always dream about our future lives. She aspired to be a doctor, and I aspired to help people in the developing world. In high school she wasn’t sure if she wanted to work with women and babies or be a medical missionary to Africa. If she could, it would be both. Nothing could stop Amanda. We would dream about our future husbands and write out lists of required characteristics. Her’s was the standard: athletic, smart, funny, lover of Jesus, and six-pack abs. I was willing to forgo the six-pack abs if he loved to travel, was bilingual and loved to hear me sing. Regardless, we would talk about the importance of purity and saving ourselves for our husbands (aka Knights in Shining Armour, second to Jesus). We both were anxious to fall in love and become beautiful pure brides. As Amanda and I got older, we saw more of our big dreams come true. We kept in touch the first two years of university but with time and space slowly drifted apart. I traveled around the world, grew in my love for evangelism, and missions in the developing world while Amanda traveled to Africa for missions, graduated from Queens and got an early acceptance into medical school. We were both on track, growing with Jesus and experiencing an adventurous life of blessing. She had even fallen in love with her lifetime crush: Jonathan Taylor. Last week on January 5, 2014 Amanda and Jonathan were driving back to Ottawa and in the midst of a terrible storm they hit oncoming transport truck and she passed away. Jonathan survived with several injuries, so please pray for healing (physical and emotional), for him. He made it to the funeral which was this past Friday and he spoke, sharing about his love for his “pretty, pretty girl”. Amanda’s funeral was really a giant celebration of her life, and her love for Jesus. When I look at Amanda’s life, I really see Jesus. How he transformed her, redeemed her, cherished her, blessed her, and worked through her. I feel incredibly blessed to be part of her giant spiritual legacy which lives on in so many people. If you have ever been blessed by me, or God has used me to impact your life, you are part of my spiritual legacy which means you are also part of Amanda’s. Amanda’s faith was so strong, and I know that she believed that God doesn’t make mistakes. He knew when He created her, how her life would play out. And if Amanda knew she was going to die at 22 she wouldn’t have lived life any other way. That’s such a beautiful thing. Amanda is Pappa’s little princess, now wearing a real crown of everlasting glory. She’s dancing with Jesus, her Knight, and worshiping in heaven along with all the Saints wearing the most beautiful dress. What a beautiful place to be. Her life is a celebration of Jesus’ love for all of us. It was her deep desire that we would all come to know Him in an intimate way just as she did. There are a million more things that can be said about Amanda, and last Friday was an amazing opportunity to hear about her life, faith, and how she impacted the lives of so many. I miss Amanda dearly but I know that she is in a better place. Each day is another day closer to when I get to be reunited with my dear friend. If you are able, please continue to pray for the Kelsall and Taylor families and they navigate with God through this time. Amanda, I love you and I know that you are now that beautiful pure bride in heaven. I can’t wait until we are both wearing beautiful crowns and dresses and dancing as princesses together again. 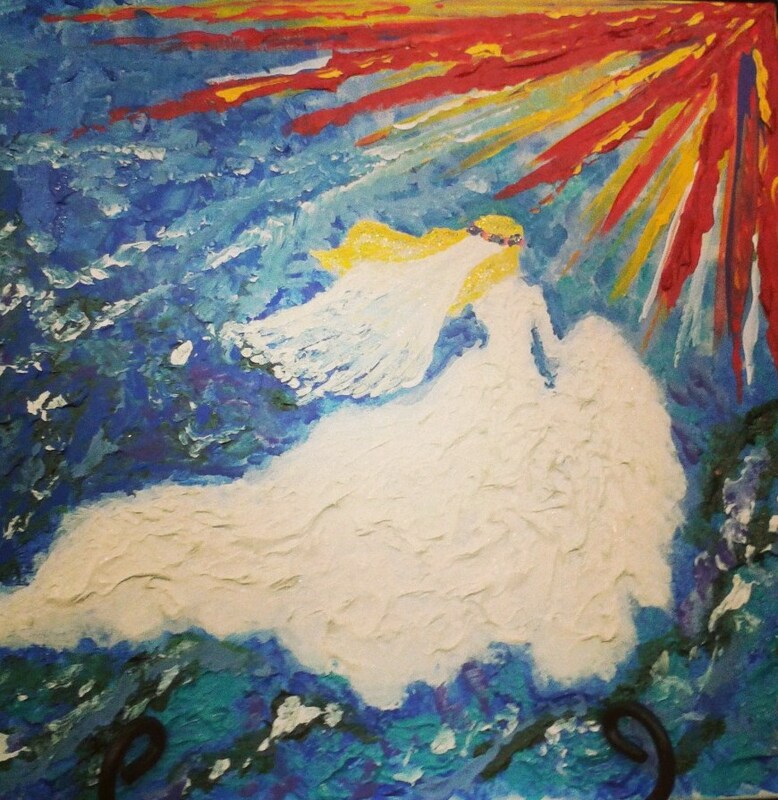 Amanda painted this several years ago, seeing herself as that pure Bride ascending into heaven. 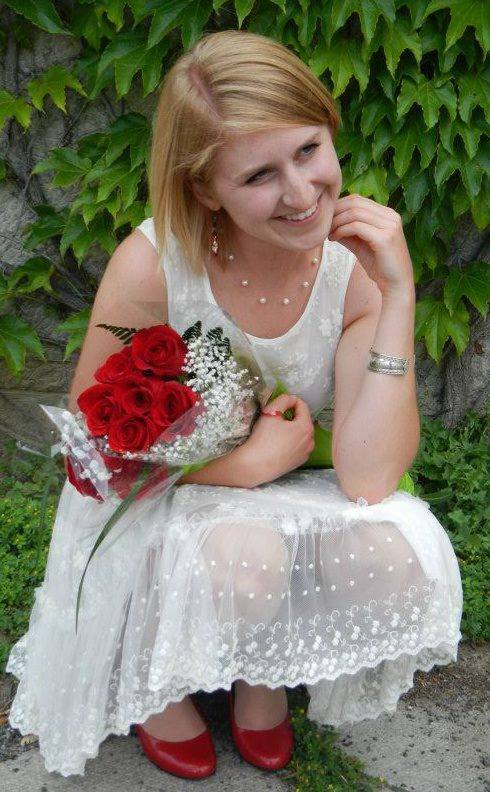 Donations can be made to the Amanda Kelsall Fund at the University of Ottawa to financially support undergraduate medical students. English: alumni.uottawa.ca/medicine. French: alumni.uottawa.ca/medecine. Alternately, donations can be made by calling 1-888-352-72222 (outside Ottawa) or 613-562-5800, extension 3417 (in Ottawa). Please comment below your favourite memory of Amanda so we can all remember and celebrate her! Thank you for this beautiful tribute to my girl.